As I said previously, I returned from Fort Collins in the wee small hours of Wednesday. Wednesday?? the day was just a big blur. On my way back to Providence via Southwest Airlines I was fortunate enough to see the practically full Harvest Moon at 37,000 feet or FL370 in “pilot speak” at sunset. The colors and sight were absolutely amazing. The scratched and somewhat dare I say grungy windows of my 737 made a decent photographic image virtually impossible. 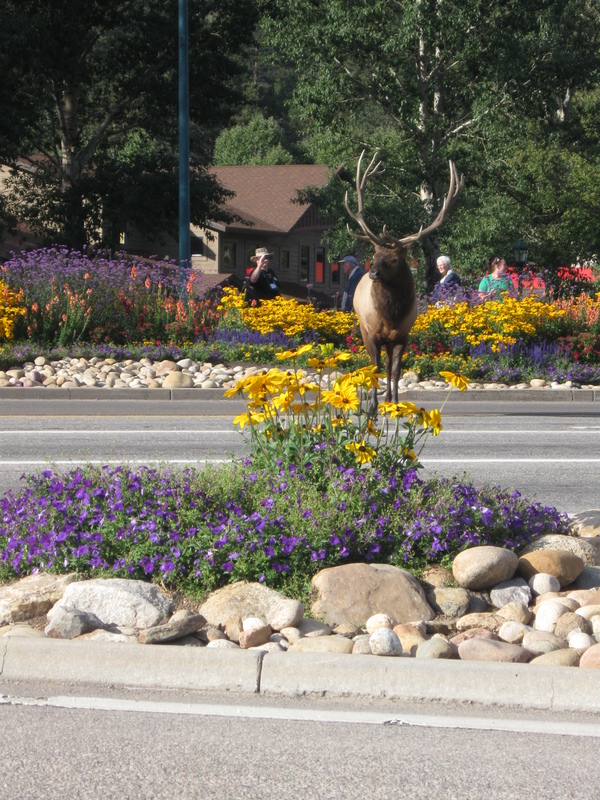 I did manage on Thursday to take a look at some of the photographs I had taken in CO and decided that I really needed an enlarged print of the bull elk crossing Elkhorn Ave in Estes Park. Thank you to the gang at Coopers Imaging in Norwich for doing such a bang up job of that image and a couple more that I was thinking about including in the Something Simple Café show on Friday. Later Thursday afternoon a speed run to Coopers to pick up the enlargements. WOW!! if I do say so myself. Friday morning, up as my son says at “O dark 30” had some coffee and mounted and framed the huge elk image and 3 others. Somewhere in there 2 loads of laundry were done and several cat naps. Friday evening was a blast! Special thanks to Debbie Stauble for getting the word out about the show and to Jessica Dapsis for the venue and super yummy desserts and coffees available. I met some outstanding people while explaining the whys and wherefores of some of the images. I must say that a fun time was had by all! The show continues until October 15th, stop by if you have time. Care to guess who slept for 11 hours Friday night and Saturday night. Saturday was a TV DVR marathon of shows I had missed while away punctuated by major dozing off. It’s now Sunday and I’ve finally made it to the grocery store and farmers market here in Colchester this morning. There are 4 days of newspapers on the couch still in their plastic bags. They may get some of my attention for the afternoon while watching the Patriots in 36 minutes (but who’s counting}. GO PATS!!!! Please keep the folks in northeastern Colorado in your thoughts as they recover from the disaster out there. Below is the St Vrains River as it passes through LaPorte CO as it began to recede after the “flood of biblical proportions” earlier in the week. So the book is now closed on my 2nd trip to Northern Colorado. My departure from Denver was uneventful and Southwest brought a full plane load of us safely to Providence. 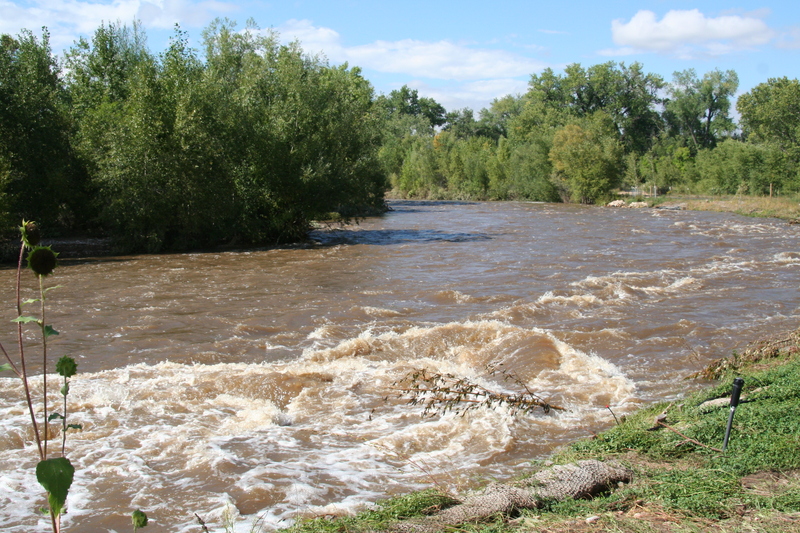 The Green Ride shuttle from Fort Collins to Denver down I-25 South was punctuated by stunning views of the Rockies and torrents of raging flood water from Lyons, Estes Park, Longmont and Boulder rushing under the bridges we were crossing. I crawled into bed around 1:30AM Wednesday morning! By Thursday morning my stress level was climbing again because Friday evening is the opening of my photo show at the Something Simple Café in Hebron, CT. I’m so looking forward to it but apprehensive at the same time. And so in a phrase that was a source of great agony to my Roslindale High School English teacher, Miss Tolland, “tired but happy the weary travelers made their way home”. It’s great to be home but a huge “thank you” to J & P for their hospitality under less than optimum circumstances! 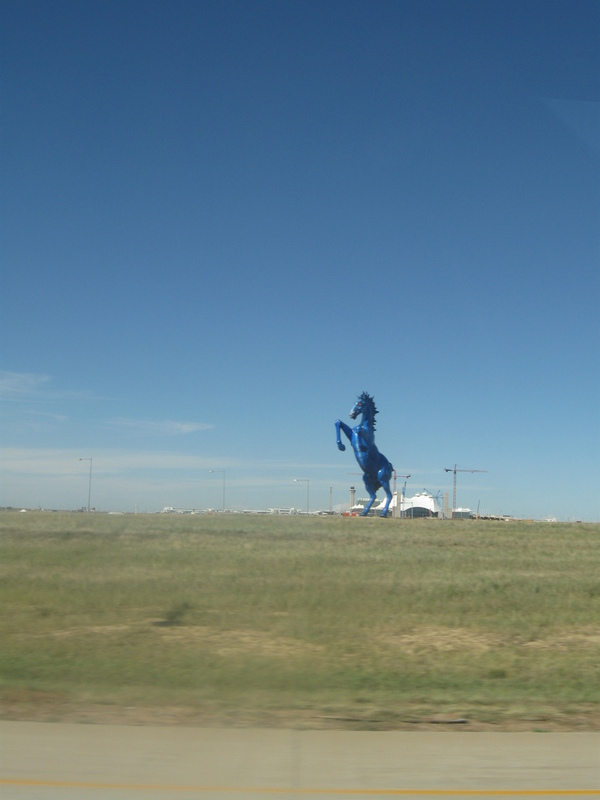 This photo of the big blue guy is the hello/goodbye monument as you enter or leave Denver International Airport and was taken through the window of the shuttle travelling about 50 mph +/-. I love my Canon cameras! The sun is out in Larimer County, CO!!! We were fog bound again this morning but it had started to lift by the time we headed into Fort Collins to do some errands. We had lunch at a charming Vietnamese restaurant the Saigon Grill 3 a tiny little place with really good food. On our way home we detoured to see if we could view any of the flooding that was hopefully on it’s way out of town. 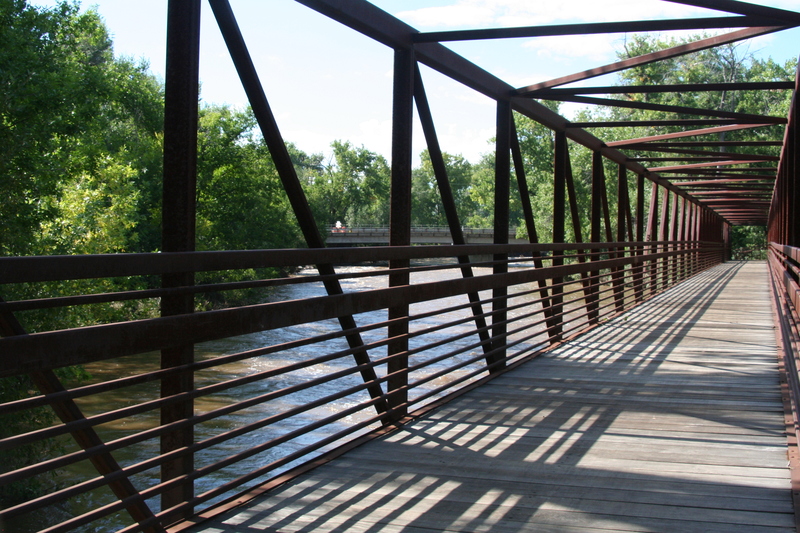 In the town of LaPorte there is a newly rehabilitated park on the banks of the Cache le Poudre River where the Overland Trail crossed over heading west. The photographer in me wanted to see so I got out of the car, crawled under lots of yellow tape and smiled sweetly at the National Guardsmen stationed at the other side of the bridge. 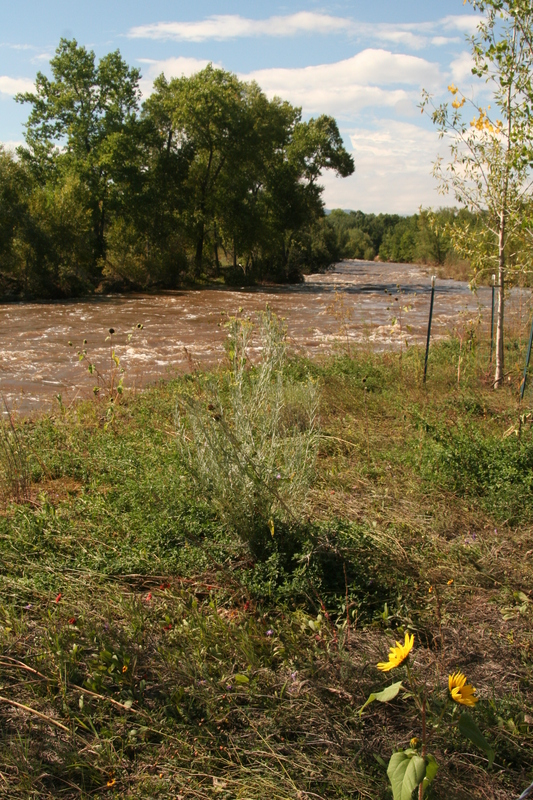 The river was still a raging torrent although significantly lower by perhaps 4′- 5′ judging by the mud and branches caught along the edges. On one of the walkways there was a dead fish, obviously left behind as the water had started to recede. 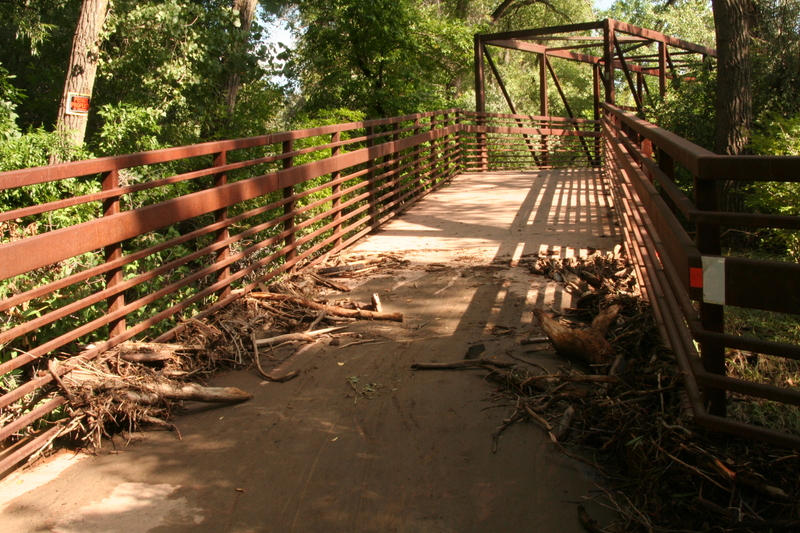 I followed a path that lead to a newly constructed bridge and ventured out onto it since I had just seen a young man in a wheelchair with his dog approaching from the other direction. 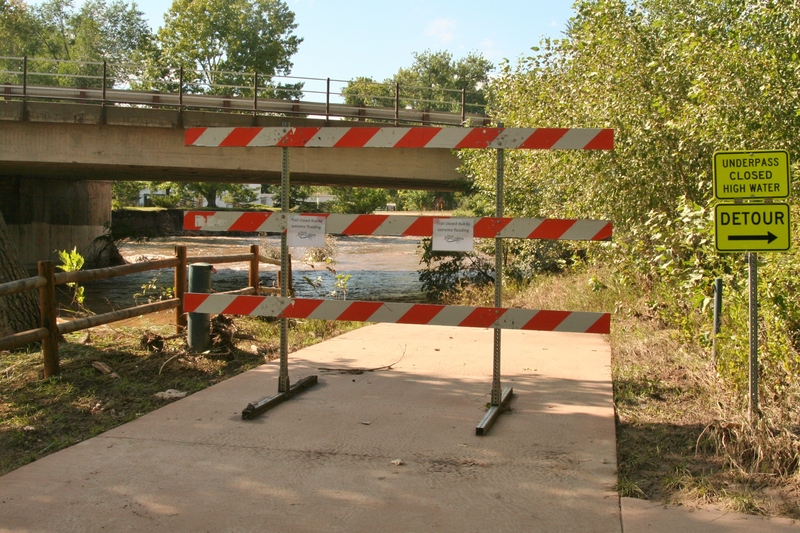 I must admit that I did feel the bridge vibrating under the stress of the rushing water but returned safely to the car. 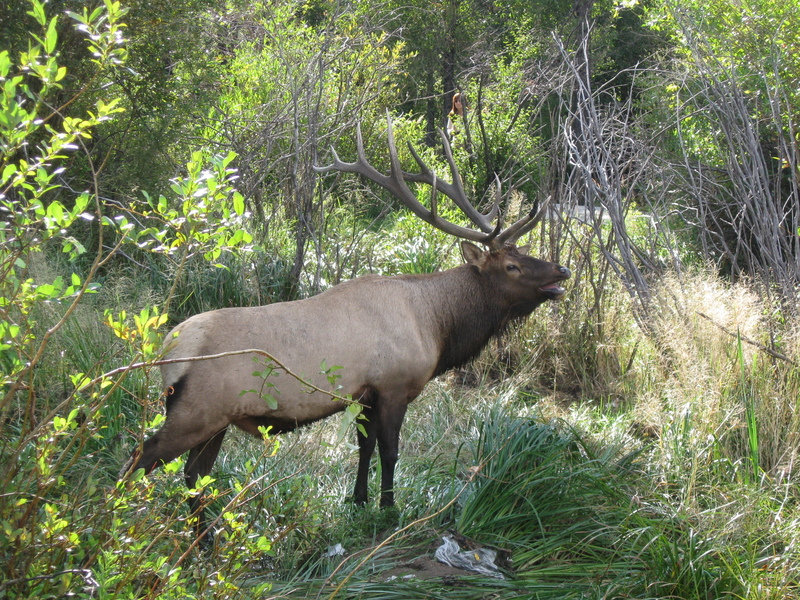 So what’s new along the front range of the Rocky Mountains here in Northeastern Colorado? Did you hear that it’s been raining since last Wednesday? Local news stations are reporting flooding of “biblical proportions”. The power of water to create havoc is absolutely incredible. Fortunately, as I mentioned in my previous post, I’m with friends who’s home is out on the high plains so although we are waterlogged, we are not in any danger. 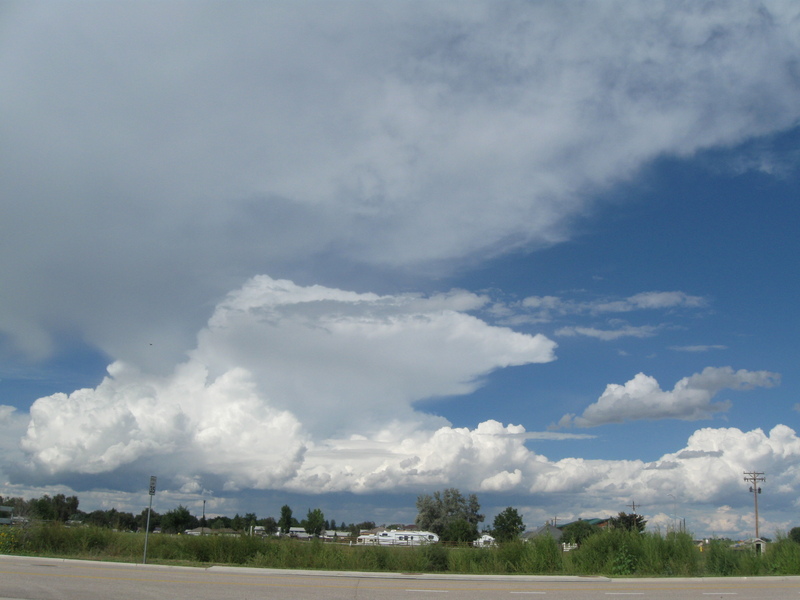 The first photo attached is a panoramic view from Wellington looking west to north. 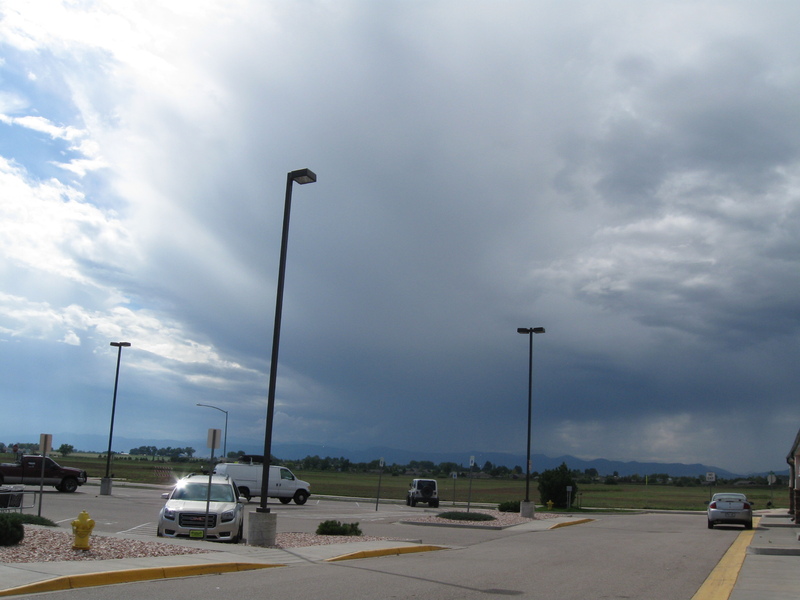 The dark clouds are about over the Big Thompson Canyon (click on the image and you’ll be able to see the sheets of rain falling) and the Estes Park area then panning north toward the Wyoming border. When you make travel plans in advance you have to be prepared to “play the cards you’re dealt”. 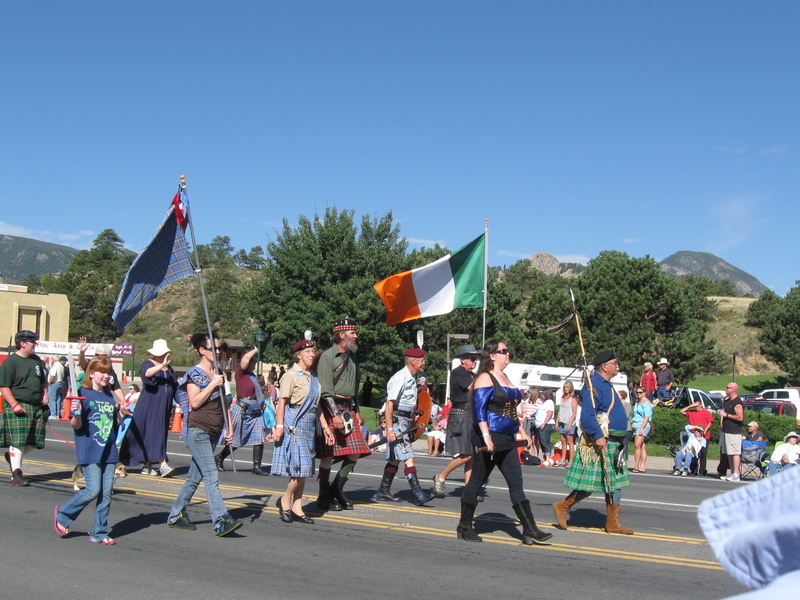 My plans for this trip included 3 days up in Estes Park with P to see the Longs Peak Celt Fest. We were fortunate enough to see it all! 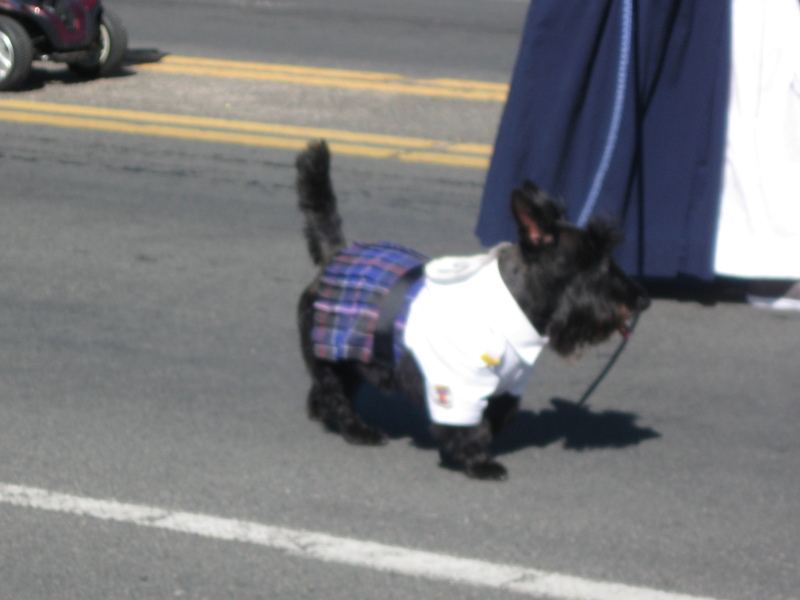 The Tattoo on Thursday evening, the clan tents and food trucks Friday afternoon and a fabulous foot stomping, hand clapping concert Highland Way, The Brigadoons and the Black Irish Bandthat featured on Friday evening. 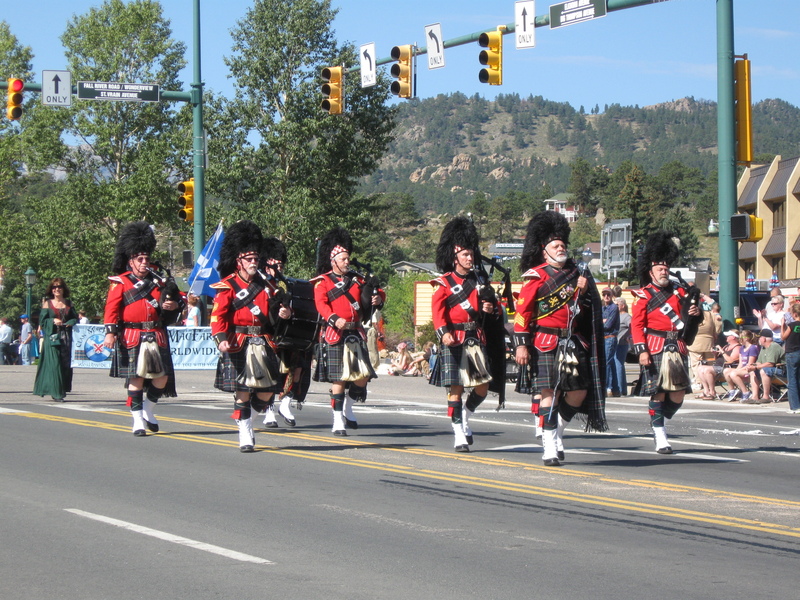 Saturday morning…brilliant blue skies, warm temperatures and the parade came marching down Elkhorn Avenue to the skirling of the bagpipers and drums keeping the rhythm. 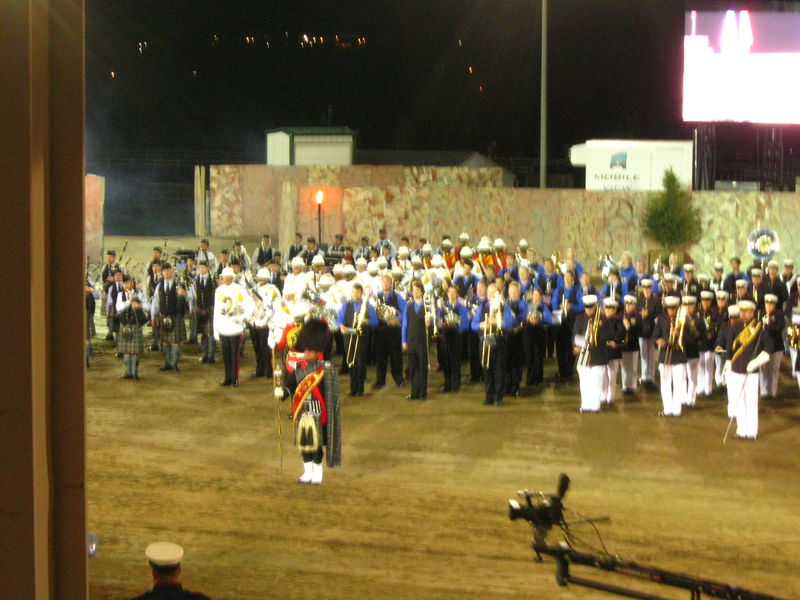 What fun cheering on the varied bands, clans and groups. Alas Clans Macintyre and Grant didn’t seem to be in attendance except for myself. And of course we visited lots of shops in Estes Park as well. We drove up to Estes Park through the Big Thompson River Canyon with the Big Thompson River flowing placidly beside us as we climbed up to Estes Park. This road is now closed and badly damaged. We came back to Waverly late Saturday afternoon and I think except for meals we dozed on and off all day Sunday. Monday and Tuesday were filled with grocery shopping, laundry and a variety of other chores and tasks. My plans for the next few days included picking up a rental car, making hotel reservations and plotting my route on the terrific AAA maps and internet. Well, it turned out that there were no rental cars available on Wednesday so I opted for Thursday and Friday. 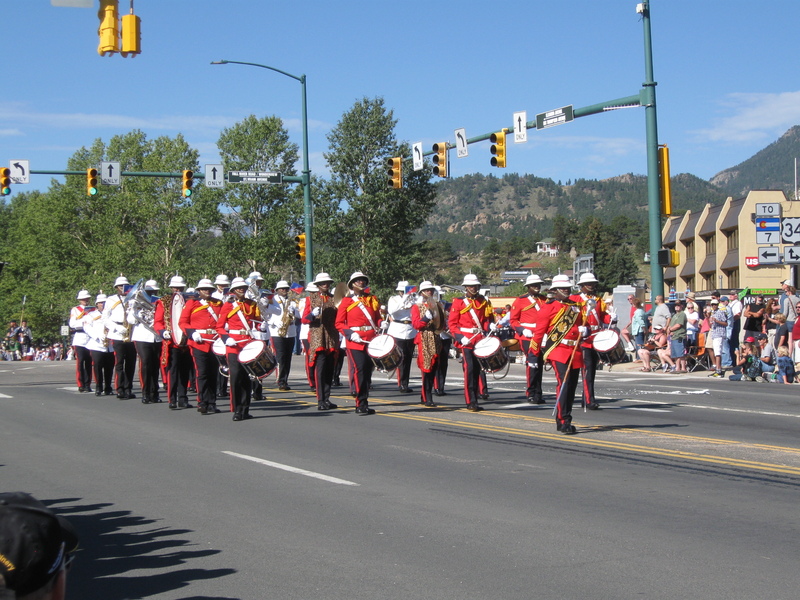 I would visit Longmont, overnight there and then proceed up CO Rt 36 through Lyons which is a very quaint town that I had seen last year and then go up to Estes Park & Rocky Mountain National Park to visit some sites in the park that I hadn’t been able to visit last year. Have you seen the news? 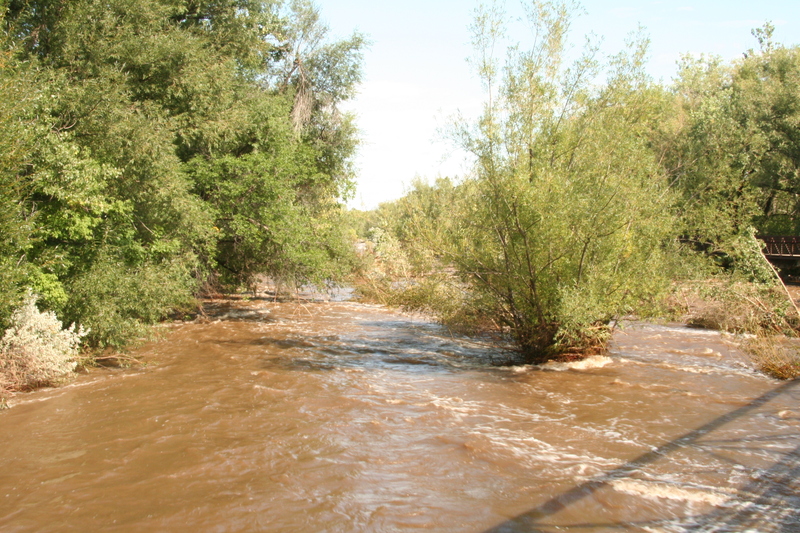 Lyons is completely evacuated and isolated by the flooding of many creeks and rivers as well as the downpours flooding down off the mountains into the canyons. 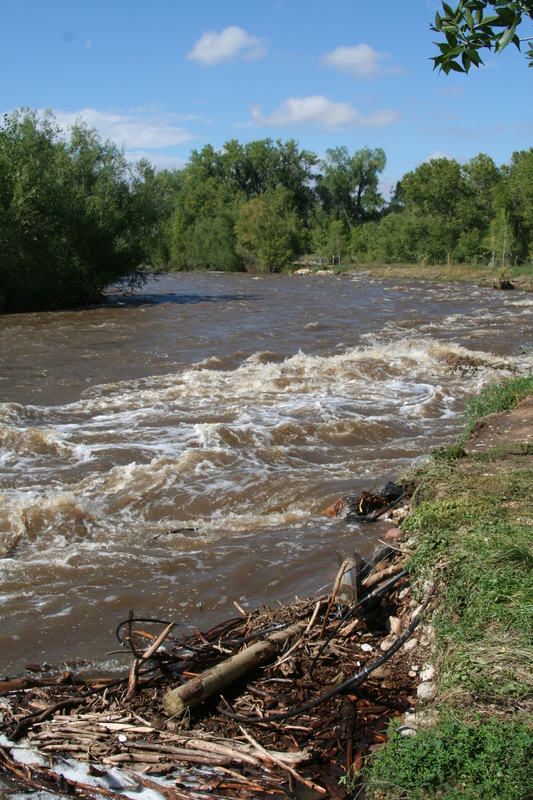 The Colorado National Guard is on the scene, a State of Emergency has been declared and lives have been lost. J, P and I are safe and comfortable since their home was built out on the high plains and not in the mountains or canyons as many, many people have chosen to do. 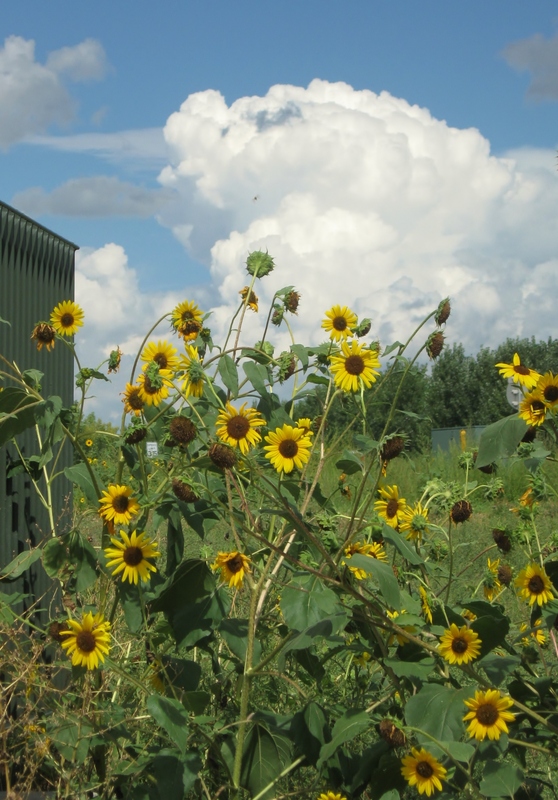 They are safe here from virtually any fires or flooding. This was a conscious decision on their part to build here rather than in the “hills”. So, this is the hand I’ve been dealt and it continues to play out. Our plans to attend a “Western History and Culture Day” at the Virginia Dale Community Club have been cancelled by the club due to the flooding. We have a party planned for Sunday afternoon that hopefully the guests will be able to attend. AND we’ll need to get to the grocery store as well.